On a sunny afternoon last week, I strolled along Leoforos Vasilissis Olgas or Queen Olga Avenue in Thessaloniki, appreciating the once elegant fin de siècle villas, some now decaying and crumbling, that lined what had been the most elegant and one of richest areas of the city, and home of many ruling families at the late 19th century and the beginning of the 20th century. Wealthy Greek, Jewish, Turkish and European merchant and political built most of these architectural masterpieces. Each villa tells its own unique story. Some are galleries, others house cultural and historical institutions. Many retain their detailed colourful decorations, some even their impressive furniture, all influenced by the eclecticism of the 18th and 19th century. Several villas have been preserved after painful restoration efforts, including the Villa Mordoch, the Villa Ahmet Kapanci (1890), the Villa Mehmet Kapanci (1893) and the Villa Bianca. Others are still sadly awaiting restoration after many decades, including the Villa Hirsch and the Salem Mansion at No 20. 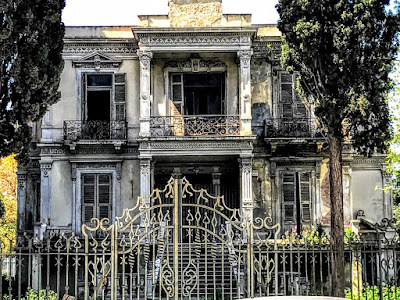 The Salem Mansion was designed in 1878 by Xenophon Paionides (1863-1933), who was, perhaps, the most famous Greek architect in Thessaloniki. He was born in Fourka in Halkidiki in 1863 and studied architecture in Athens and Munich before returning to Thessaloniki. His villas on this street include the Hassan Pristine or Hafiz Bey Mansion, which became the School for the Blind (1879), the Frederic de Charnaud Mansion, also known as the Hadzilazarou or Siaga Mansion (1899), and Seifulah Pasha Mansion or Villa Mordoch (1905), which is regarded as his masterpiece. Paionides was the official architect of the city’s Greek Community for the first quarter of the 20th century. His public buildings in Thessaloniki include the Analipsi School (1909), the Hamidye Hospital, now the Aghios Dimitrios Hospital (1903), and the Metropolitan Cathedral of Saint Gregory Palamas (1914). Paionides died in Saint Anastassia Monastery in Halkidiki in 1933, and was buried in Thessaloniki. Paionides designed the Salem Mansion wealthy Jeborga (Τζεμπόργκα) Jewish merchant family in 1878. It was bought in 1894 by Emmanuel Salem. the most important lawyer in the city and an eminent member of the Jewish Community. It remained in his family for over 20 years and the family gave it its name, the Salem Mansion (Η Επαυλη Σαλέμ). 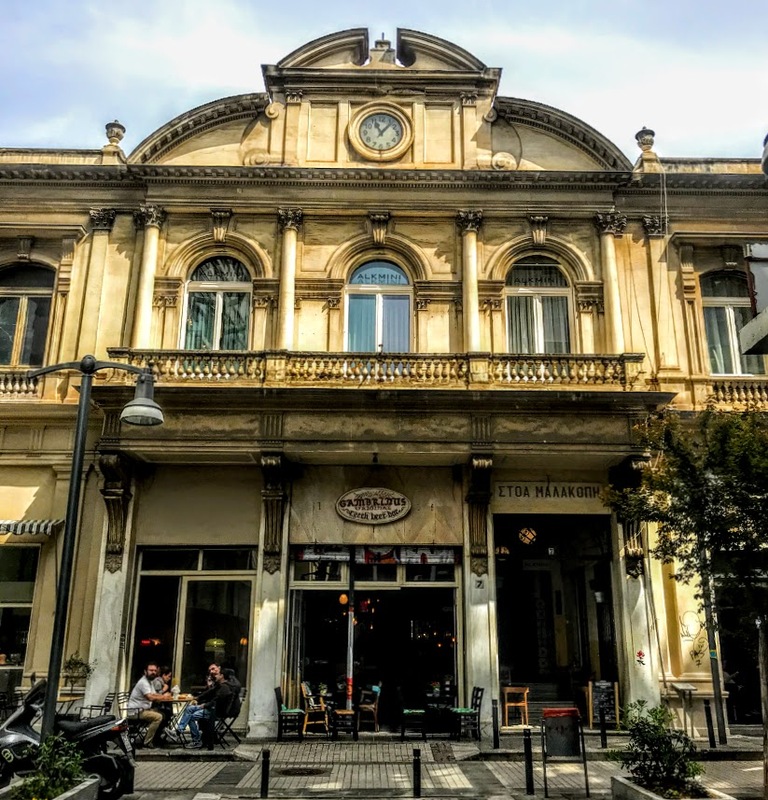 The three-storey Salem Mansion is one of the finest examples in Thessaloniki of the city’s neo-baroque eclecticism. It has an elaborate façade and is built with luxurious materials. It has baroque pediments, and its architectural styles combine elements of classicism, renaissance and baroque styles. a The villa changed hands during World War I, and when the Salem family left in 1915 and the villa became the Consulate of the Austro-Hungarian Empire. It was bought by the Italian state in 1924, and for it served as the Italian Consulate for more than half a century, until 1978. The Salem family came to Thessaloniki with the wave of Sephardic Jewish refugees fleeing Spain and the Spanish Inquisition after 1492. They first appear as a prominent family in Thessaloniki around 1550, when Avraam Salem, perhaps a medical graduate of Coimbra University, was practicing in the city as a medical doctor. Other members of the family became involved in the commercial life of the city, and were generous philanthropists. Avraam Salem was a great genefactor of the Jewish community, Salomon Salem became the Chief Rabbi of Amsterdam, while Chaim Salem founded a school. Emmanuel Salem (1859-1940) was the first general secretary of the Bar Association of Thessaloniki and was one of the three most important lawyers in the history of the city. Emmanuel Salem was born in 1859, the son of Rabbi Raphael Salem. He graduated in law in Constantinople in 1879 and soon became a leading member of the Jewish Community in Thessaloniki and one of the most prominent jurists in the field of international law in the Ottoman Empire. He was involved in founding a new water company, gas company, tram and electric company, and also in founding the Banque du Salonique, of which he was a board from 1891 and an executive director from 1918 to 1937. He played a major part in the founding of the Bar Association of Thessaloniki and was its first general secretary – the president was a Turkish Muslim, the treasurer was a Greek Christian and the official language of the association was French, an indication of how Thessaloniki was a multicultural and cosmopolitan city at the time. Salem was also involved in many Jewish welfare organisations including hospitals and charities, and in the founding of the Allatini Orphanage on Velissariou Street. For his diplomatic efforts during a dispute between the Vatican and Ottoman Empire, Salem was decorated by Pope Leo III in 1889. Before the outbreak of World War I, Salem was involved in the committee demanding reforms in the Ottoman Empire in 1908 although he favoured the Sultan rather than the cause of the Young Turks. After World War I, Salem was involved in negotiating the Lausanne Treaty in 1923. He received honours from many countries, including the Austro-Hungarian Empire, Italy, France, Belgium, the Ottoman Empire and Turkey, and Greece conferred on him the Order of the Saviour. Salem later moved to France, and he spent the latter years of his life in Paris, where he continued to practice law. But he remained in involved in major enterprises linked to his home city, including the Banque de Salonique and the Salonica Cigarette Company, as well as the Cairo Stock Exchange listed. He became the President of the Thessaloniki Jewish Association in Paris, which later became part of the Religious Sephardic Association of Paris, and was a board member of the Alliance Universelle Israelite and the Great Council of French Jews. He died in Paris in February 1940. Emmanuel and Fortunè Salem were the parents of Raphael Salem, who was born in the Salem Mansion on Vassillis Olgas Avenue on 7 November 1898. With the outbreak of World War I in 1914, Emmanuel Salem sent his family, including his wife Fortunè, their son Raphael, and their daughter to Paris. There Raphael graduate in law and he first worked as a bank manager. But he went on to take a degree in engineering and later received a PhD in Mathematics after his friends recognised his mathematical talents. He married Adriana Gentili di Giuseppe in 1923, and they were the parents of three children. At the beginning of World War II, he joined the French army and was sent to England as part of Anglo-French co-operation. Sadly, his mother, his sister, her husband and one of their two sons were among the 6,000,000 Jews murdered in the Holocaust. Raphael Salem migrated to the US in 1941, where he became a lecturer and then a professor at Massachusetts Institute of Technology (MIT), and was also a visiting professor at Harvard and Stanford. He returned to France when he was appointed a professor in Caen and in 1955 he moved to the Sorbonne. Raphael Salem was probably the greatest mathematician and scientist born in the Greek world since ancient times. The Salem Prize (Prix Salem) is a prestigious award to mathematicians whose work is in Complex and Harmonic Analysis, and he is remembered at the Raphael Salem Laboratory of Mathematics in the University of Rοuen. His son, Lionel Salem, is a prominent Chemistry Professor in Paris and at Harvard. The Salem Mansion was damaged extensively by the earthquake that devastated Thessaloniki in 1978. It was abandoned by the Italian Consulate, which moved to the complex at the Italian Monopoli di Stato, which included the Italian Institute, built on the site of the demolished Villa Ida on Fleming Street, formerly Mizrachi Street. Five years ago, the producers of the television series American Horror Story, starring Jessica Lange, chose the Salem Mansion for one of the posters for the series in 2013. Of course, there was no mention of either Thessaloniki or Greece, and the house was supposed to be somewhere in New Orleans. The house still belongs to the Italian State and is deserted. Although this is a listed building and the grass is cut from time to time, all requests from the Greek State for its restoration have gone unanswered. My Holy Week, Good Friday and Easter experiences in Thessaloniki prepared me to return to parish ministry with a new energy. Over the past few days, the Easter Vestries for three of the four churches in the group of parishes have met in recent days, and the fourth meets this evening. Work parties have continued to attend to the rectory gardens, I have been to Adare to preach at the Mothers’ Union Lady Service, celebrated the Feast of the Annunciation at the Eucharist in Saint Mary’s Church, Askeaton, there were services and sermons in Askeaton and Tarbert yesterday, and there was a posting to finalise for the diocesan training programme for clergy and readers. Later this morning, I am in the school in Rathkeale, and the coming week promises to be as busy as the past week. 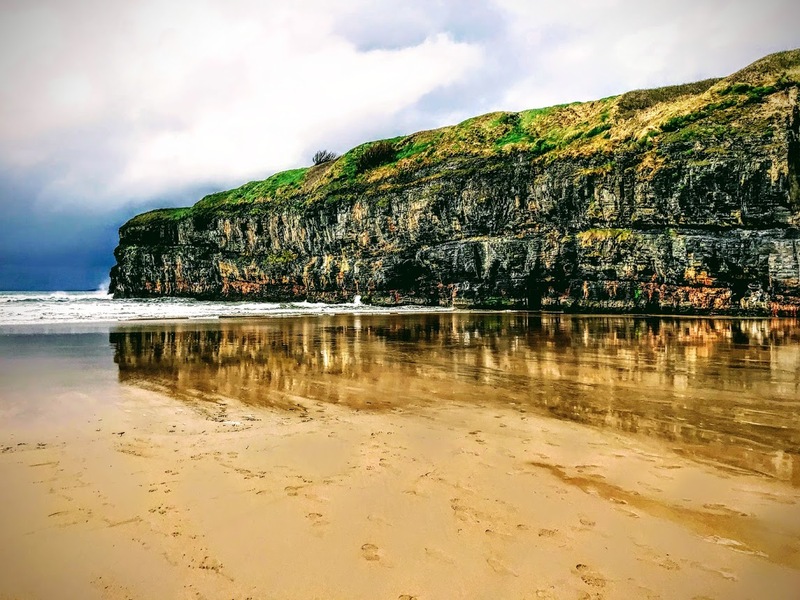 But in between, two of us managed to take some quiet time on Sunday afternoon, and went for a walk on the beach in Ballybunion. The tide was just turning and about to come in, but the sand was a beautiful combi nation of sliver, yellow and gold, and the sun was making efforts to break through the grey clouds. Only a week previously, we had been sitting at the sea wall at the harbour in Thessaloniki, waiting for friends to join us for dinner, as we watched the tide lapping gently against the sea wall as we looked across the bay towards the White Tower. Being on the sand by the waves evoked some of those Resurrection stories in the Gospels in which the Risen Christ meets the Disciples on the shore after they have been fishing and shares a meal with them. We had climbed back up to the ruins of Ballybunion Castle on the cliff top before the rain began to fall, and we adjourned to Daroka for a delightful lunch. On the way back, we stopped at Beale Beach for another breath-taking walk by the sea at the mouth of the Shannon. By now the tide was in, the waves were breaking against the pebbles on the shoreline, and gushing again as they pulled against the stones as they rushed out. Out in the estuary, three ships were making their way out to the Atlantic. Easter is a time to set our eyes on new hopes, on new horizons, on the promise of new futures.